They don’t call it the Alligator River Kayak Tour for nothin’! Perhaps the Crown Jewel of our kayak tours quiver, the Alligator River Kayak Tour on the Outer Banks rarely disappoints!!! Home to the OBX’s most robust gator population, sightings are frequent on this tour. But don’t fear, despite conventional wisdom to the contrary, gators are shy and elusive creatures and are not aggressive. This is one of our most exciting and beautiful kayak tours; it is also our longest tour at 2.5 hours. 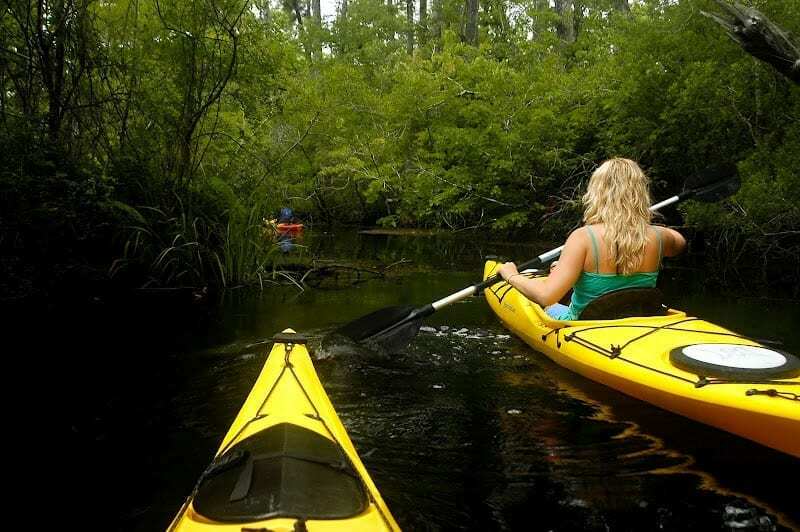 A true Outer Banks treasure kayaking in Milltail Creek, home to an old logging and whiskey distilling community during Prohibition amidst the spectacular natural beauty of the Alligator River National Wildlife Refuge. Who knew the OBX had black bear, endangered red wolves? Also see your staple water fowl of snowy egrets, great blue herons, and the once endangered red wolf all call this area home, so come check ’em out and paddle the refuge with us. The Alligator River Kayak Tour on the Outer Banks will definitely quench your OBX kayak tour thirst, and is a must do on any self-respecting kayakers To-Do list for Outer Banks Kayak tours. Let the Kitty Hawk Kayak & Surf School deliver this incredible OBX kayaking experience today. We will meet at the Buffalo City Boat Launch off of Buffalo City Road and 64 West. Look for a big, brown sign that says Buffalo City Road and follow the dirt road to the boat launch. Please park in the designated parking areas.